The Tour of America will solve the world’s biggest problem by engaging in the world’s most universal activity using the world’s greatest example. The second part of our mission is the “how” – How are we going to solve the world’s biggest problem? Mission statements are typically unwieldy, and so in our case, we are taking a bit of license with our definition of “Universal Activity” and ruling out basic bodily functions: eating, procreating, walking, running – things like that. There are a lot of things that people do that are a function of human existence, and that’s not what we’re talking about here. So putting those things aside, what might we consider the most universal activity – the one that people engage in on the most massive scale? The answer is as simple as . . . riding a bike. Somewhere around 100 million people in the United States ride a bike (VeloNews.com) and nobody really knows how many do around the world but there are over a billion bikes, with half a billion in China alone. A lot of bikes around the world are shared, so we can estimate that there are more riders than actual bikes. If we had to guess, we’d say at least 2 billion, or a little more than one of every four people on the planet use a bicycle. It all adds up to a safe conclusion: the world rides bikes. Consider that riding a bike is the only activity that is four different things: It’s a sport, it’s a leisure activity, it’s a form of exercise and it’s a mode of transportation. That last thing is probably most responsible for it being the world’s most universal activity: the powerful human desire to go from here to there. That desire begins when we learn to walk and in one form or another, it never really goes away. Bicycles have always taken us to the next level of our human ability to transport ourselves; they are an extension of our bodies and a means of accessing the larger world. They have been relied upon in times of war and peace, they are critical to the survival of many, allowing them to get to work or to sources of sustenance, and of course, they give us great joy – the pleasure of moving forward under our own power, expanding the breadth of our experience by bringing us to places we otherwise might not get to. 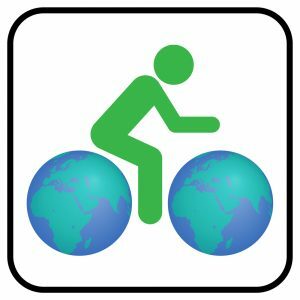 To sum it up, bicycles expand our world. It’s all very simple, this bike riding thing. Lots of great inventions come and go, but the bicycle will always be with us because it is so close to us. It is fundamentally different from other modes of transportation because it delivers the pleasure of a return on our physical investment – we are the source of energy and the beneficiary of the result: we’ve gone from there to here. This is why cycling is our most universal activity and why it is ideally suited to help solve our greatest problem. When we consider what we call a “platform” in the marketing biz, we’re always looking for an activity that lots of people are engaged in, whether physically, visually or intellectually, as a way of communicating a message or call to action. “Platform” is a great metaphor – it is a way of rising above the din of a large crowd and getting their attention. Of course, first you need a large crowd, and cycling – as universal as it is – has the potential to draw a very large crowd. The Tour de France has about 12 million onsite fans and an estimated two billion viewers each year. Nobody really knows for sure, since TV can’t figure out the number of unique viewers, but estimates of the number of people who watch the Tour de France range from one to four billion. The Tour of America is not going to flip a switch and get a billion people to watch us, but we know we can draw a crowd of viewers, and that crowd will be from all over the world. They will watch people doing something that they probably already do themselves – ride a bike – and they will be from many of the 200 or so countries around the world that have internet access, which, today, is almost all of them. And a lot of them will see something they may not have seen before: they will see women being honored and celebrated, doing something that they love, competing, thriving, committing and succeeding – all of it in front of a mass audience of humanity as they step up on the podium. Delivering these images, making it real: That is the beginning of helping us solve the world’s biggest problem. This is our journey – this peloton of forward progress – and that leads us nicely into Part 3 of our mission statement and our next installment next week: The World’s Greatest Example. Thank you for reading (and riding) along with us!